The inside mirror is designed so that it automatically dims during night time conditions and according to the intensity of the headlights of the vehicle following you. 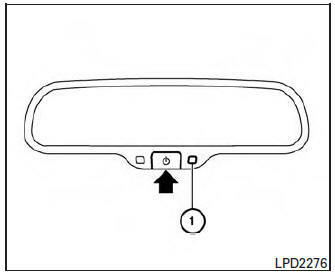 The automatic anti-glare feature is activated when the ignition switch is in the ON position. NOTE: Do not hang any objects over the sensors 1 or apply glass cleaner to the sensors. Doing so will reduce the sensitivity of the sensors, resulting in improper operation. The indicator light will illuminate when the automatic anti-glare feature is operating. To turn off the anti-glare feature, press the button. The indicator light will turn off. To turn on the anti-glare feature, press the button again. The indicator light will turn on.